Summertime is the perfect time to get out on the open road and explore some of the world’s greatest water wonders. Whether you’re headed around the corner or around the globe, water wonders are everywhere. Sometimes water wonders occur in nature and sometimes they’re man made. For this list, which will be in no particular order, we’re staying all-natural and going all over the planet to give you a glimpse of the best Earth has to offer. The world’s tallest waterfall can be found in the Bolivar province of Venezuela – and it’s a doozey. 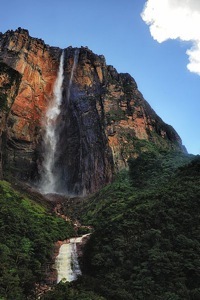 Angel Falls has been measured at 3,212 ft. although many have challenged the claim. As it happens, measuring waterfalls is not easy, especially when the drop is well over a half a mile from top to bottom. Tugela Falls in South Africa is also a contender, and arguably easier to access, but if you want to get off the beaten path and see truly wild water wonder, this is the waterfall of them all. If you want to explore the deepest lake in the world, you’re going to have to book a flight to Siberia. At 5,369 ft. Lake Baikal is just over a mile deep … and that’s deep. To give you a better idea, Lake Baikal contains more water by volume than all the Great Lakes combined and is ancient by comparison. It also contains hundreds of endemic species of animals – animals that only exist in the lake. If that wasn’t cool enough, legend has it that one of these rare creatures may be some kind of monster like that which lives in the famed Loch Ness, although of course no one has seen it. Sistema Ox Bel Ha, Mayan for “three paths of water,” is the world’s longest underwater cave. Although not the deepest underwater cave system, Sistema Ox Bel Ha in Tulum, Mexico, stretches just shy of 145 miles, but technically it’s still being surveyed. Similar cave systems located in the same area of Mexico approach this length, too, so it’s hard to know whether the record will remain considering Ox Bel Ha was just recently discovered in 1996. Exploring this system is possible, but it will take time, commitment and training. 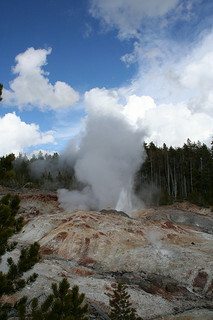 Steamboat Geyser is the world’s highest active geyser and is located very near its more famous cousin, Old Faithful, in Yellowstone National Park, Wyoming. Steamboat’s record-breaking blasts (up to 390 ft.) are few and far between, which is one of the reasons why the more predictable Old Faithful gets all the attention. Interestingly, Steamboat has only recently (in geological time, anyway) earned the record-holding slot. Waimangu, in Iceland, had a banner run from 1900 to 1904, when the geyser was destroyed by a landslide. The Dead Sea often gets the honor of being the world’s saltiest body of water when in fact the award should go to Lake Assal, in Djibouti, Africa. Lake Assal is 10 times saltier than any ocean and rests at the lowest point in Africa, 510 ft. below sea level. It may seem like a wasted trip to go see something so salty (and consequently deadly to any who go in unprepared), but the mineral content creates beautiful deposits around the rim of the lake, which is often the colored the purest blue.